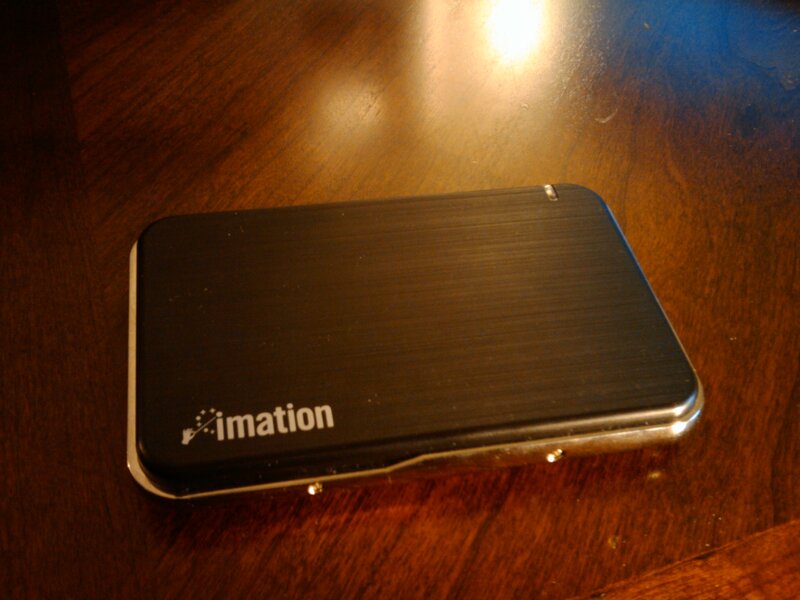 A few months ago I got an Apollo 500GB 2.5″ portable hard-drive from Imation. It’s nice and compact and I used it to store movies, music and other random crap. About a month ago I was trying to copy a few files onto the device when I noticed that operation was extremely slow. It was so slow that it was pretty much unusable. I wanted to test it out and see what the problem was, but I got busy with work and also my parents were visiting and so I was flying to California almost every weekend. When I finally got around to testing it out, I found that I couldn’t even mount the drive properly now. I could neither do it in Windows 7 nor in Ubuntu 9.04. Ubuntu would recognize the drive and it also saw that there was a partition on there, but other than that it wouldn’t do anything. I tried to use gparted to format it, but it wouldn’t even show up there. In Windows 7, I used Computer Management and when to Drive Manager. Intially the drive wouldn’t show up, but after unmounting and remounting it a few times, it finally showed up. I deleted the existing partition, made a new one, and then tried to format it. The format never finished; it was taking far too long. I then tried to format it in Ubuntu and this time gparted saw the drive, but it was unable to format it as well. I suspected that it might have some hardware issues (which is strange, because it’s not like I used it in a rough manner. Imation should probably make their drives tougher!) and so I tried to run some SMART tests on it. Ubuntu’s smartmontools doesn’t support USB drives. But on Windows, I used a trial version of ArgusMonitor to test the drive. As I suspected, there were a whole bunch of errors. Many sectors were unreadable and Argus suggested that I back-up all data immediately. I didn’t have much data on there anyway and so I figured the drive was pretty much toast. Then for kicks I wondered if I could replace the internal hard-drive. It’s basically a 2.5″ SATA hard-drive and I had an extra one lying around, and so I decided to see if I could replace the hard-drive. The first step, obviously, is to disassemble the drive. This was actually a little difficult. I should point out right now that if you decide to go ahead with this, you’re probably voiding your warranty. Please don’t hold me responsible for any damage that you might do to your drive. Also, you might end up scratching the exterior a bit (especially along the chrome edges). It’s not that noticeable unless you examine the disk closely. Thanks a lot. I did open mine to check the guts, and found out that the external cable was to blame! I’m glad you got it working! Thank you so much for your detailed directions AND photos. Helped a lot, made my day !!! No worries! Glad I was able to help! It is a 2.5″ drive, so it is the same form-factor as a laptop drive; it should work. hey I can’t remove the plastic chrome cover. can you make a video of this or provide a detail instruction? Fritz Rigonan and Vivn : I have the same problem as you guys have. And so I finally decided to open the black and silver bordered case. I opened the 4 screws given on two sides but the Case is very hard to remove. Can someone send me either the video or pics of how to open it. I am in real need as I have all the important data in that and in next week I have presentation to be shown. Sorry for taking so long to respond. I think your drive might have had actual hardware issues. This was the same thing that I was seeing with my drive. You must have a hardware issue with your drive as well. Try running some SMART tools on it to see if it has any issues. I hope your presentation went ok 🙂 I don’t know how I can explain how to remove the case any better. You pretty much have to shove a small flat-headed screwdriver in between the chrome trim and the case right behind the USB icon (don’t shove it in too hard or you’ll damage the controller). Push in towards the body of the drive and then upwards. This should make the cover pop out. awesome.. thanks for the help..
Thanx aton man this link is really helpful guys thanx a lot to the creator of this link….. Thanks a lot. I bought two of these in 2008 and both failed. Your instructions with pictures were perfect for my needs. when i used portable hard disk 500gb, imation in laptop delli5, the charger of laptop i3 was used. meanwhile i was copping the file from laptop to my portable hard disk at that time copying process is slow. i removed the portable hard disk. and i used it but any pc can’t read it even its light is ok.
pls send me the process for reopen my portable hard disk. Awesome How-To. Was able to swap my 250GB for a 750GB drive. Thanks!